Pretty much anyone who has even considered learning a second language has heard of Duolingo. It’s a place where a lot of people get their toes wet. While it’s great that they offer a free way for anyone to start learning Portuguese, the truth is that if you’re serious about learning the language, you’ll probably be better off spending your time elsewhere. That said, casual learners or those with motivational struggles could benefit the most from Duolingo. They do a great job of getting you to study a little bit each day. Continue reading our full review of Duolingo Portuguese. Busuu is quite similar to Duolingo but with some differences that are worth mentioning. First, Busuu offers a couple of very useful features that make use of their huge community of users. This is the fact that you can get your writing or speech corrected by a native speaker which is quick and easy to do. You’ll do this by looking at a picture or watching a video, then writing or talking about it. It’s really a great feature and something I’m a huge fan of. Fortunately, it’s free to use. However, the actual lessons on Busuu don’t seem to be anything particularly great but still cost $10/month. Read the full review of Busuu. LingoDeer is my favorite of the free course-like apps despite the fact that it is quite similar to Duolingo. I’ve found that the way the lessons and exercises are structured to be much more fitting to what I’d like to actually learn. I also find it to be a little bit more challenging (in a good way) that Duolingo, where often times you can answer questions correctly even if you haven’t learned anything. LingoDeer won’t be the only resource you need to use to learn Portuguese but it can give you a solid introduction to the language. In the past, they focused only on Asian languages. In fact, I haven’t actually seen them mention Portuguese on their website or in any of the app stores, but it’s there when you download the app. Read the full review of Lingodeer. If it feels like I keep comparing these courses to Duolingo, it’s because they’re all quite similar. Babbel is another one that fits this description. You’ll find familiar exercises such as matching pictures to words. While Babbel isn’t very unique and does cost money, it beats Duolingo in a couple important areas. First, the content you learn is much more practical to real-life, something that Duolingo is terrible with. The second part is that Babbel more explicitly teaches grammar rules, something that I think is really important. Read the full review of Babbel. I initially excluded Pimsleur from this post because of how absurdly expensive their courses are. Well, they recently added a subscription option which lowers the price from over $500 to buy their courses to under $20/month. So instead of being terrible value, it’s actually a pretty good option now. Pimsleur is a bit different than other courses because their focus is more on communication skills – speaking and listening. Throughout the lessons, you’ll need to participate and actively speak Portuguese. Those who use Pimsleur will end up with stronger than average speaking skills but will be lacking in grammar, as that’s not covered at all. Read the full review of Pimsleur. Mango Languages is a bit different than the other courses. Similarly though, beginners and early intermediate students would get the most out of it, beyond that, you won’t find much content appropriate for higher level learners. They focus on practical vocabulary and phrases while including useful grammar. One interesting feature that I like is the way that the color code each word in a sentence so that you can easily see which English words represent which Portuguese words. I also like that they include two types of translations; the literal translation and the one that accurately reflects the meanings. It is a pretty good beginner course, but the cost of $20 per month is a bit higher than some of the apps that are fairly similar Read the full review of Mango Languages. Udemy is a platform where pretty much anyone can create a course for pretty much anything. Not surprisingly, this includes the Portuguese language. Because it’s so easy to post a course, you’ll find some unique courses but the quality can vary significantly on a course by course basis. At the time of writing, there are 25 courses, with two of them being free. You’ll also find some of them are priced absurdly high, like $200 for something fairly basic. Never pay more than $12 on a course from Udemy. They constantly go on sale for around $10, give or take. If you find something you really like, just add it to your cart, wait a couple days, and you’ll get an email offer for a huge discount. As I mentioned in the intro, a lot of these categories are quite subjective. Obviously, the general courses will also help build your vocabulary, and some of these could fit into different categories as well. But, whatever, here are some apps that will help you learn a bunch of new words. Perhaps the best part about using apps to increase your vocabulary is that they can do things that you couldn’t do with pen and paper. With spaced repetition systems (SRS), you can review words periodically – the easier the word is for you, the less often you’ll be asked to review it. Similarly, the more you struggle, the more often you’ll see that word. Memrise is another insanely popular app. While the content is organized into courses, and can actually cover a wide variety of material, including grammar, it’s really most useful as a way to increase your vocabulary. Memrise is essentially a gamified flashcard system which uses spaced repetition to make help you remember words before you forget them. There are tons of different courses to choose from; some made by Memrise and others are user-created. Because of this, the quality and content included can vary quite a bit depending on the course. You’ll find courses about a variety of topics (body parts, dirty words, conjugations, among many more). Although there’ a premium version, most users will find more than enough value in the free version of Memrise. Read the full review of Memrise. Anki is similar to Memrise in that they both are essentially flashcard apps and are most commonly used for learning new words, but can be used for other things as well. While Memrise is very welcoming to newcomers, Anki is much more suitable for veteran language learners looking to customize their learning experience a bit more. Anki isn’t as sleek but you can make you can make it do pretty much anything you’d want a flashcard app to do. It’s completely free except on itunes, where it’ll cost $25 to download. iPhone users who don’t feel like spending that money can still use it for free from a mobile browser though. Anki also has quite a few shared decks for learning Portuguese that you can import and use. Drops is an impressively designed app available in tons of languages, including Portuguese. Unlike the other apps, it’s not customizable and the general content is the same for each language. You learn words as they correspond to different topics by completing easy activities like dragging words to the correct location on the screen. It’s free to use for up to 5 minutes each day, but if you want to use longer than that, it’d require a subscription. I doubt it’s the most efficient way to learn Portuguese, but it’s really smooth to use, and not a bad way to spend 5 minutes. Mosalingua is another app that uses spaced repetition, making it easier to learn words. They have a few extra features, like different ways to test your understanding. The words and sentences tend to be very practical. Compared with an app like Memrise, you’ll see the words in context much more. One cool feature they have is the dialogue section where you can quickly add new sentences from your dialogue to the flashcard list. The app costs $5 but there’s also an online version which is priced differently and includes different features. Clozemaster is a gamified app that reminds me quite a bit of a 90’s style video game. They focus on learning vocabulary in context, basically completing fill in the blank questions. The fact that words are studied within a sentence makes it much easier to remember the word and be able to use it correctly. You can also choose to have to type in the missing word or select from a list of multiple choice options. Again, there’s a premium version but most people will find plenty of value in the free option. This popular dictionary and translator app makes it easy to look up words and find example sentences. Additionally, you can make flashcards from the words that you look up, along with some other features that could be useful. The Ascendo dictionary is fairly similar to Bravolol’s but also has a phrasebook, verb conjugations, and vocabulary quizzes. Unfortunately, it’s only available in Brazilian Portuguese. When people think about learning a language, the skills that most often come to mind are speaking and listening. While actually speaking with a Portuguese speaking person may be the best way to improve, I decided to wait until the tutors and language exchange section to include those apps. Also, there are some great podcasts that you can use but most of them aren’t actually apps. For now though, let’s look at the apps that can be used to improve your listening comprehension and speaking ability. PortuguesePod101 may be more fitting in the general courses section but I decided to include it here. Given the name, it should be no surprise that the lessons follow the format of a podcast. In fact, the majority of the content is audio focused. The lessons focus on Brazilian Portuguese and span the beginner to advanced levels with gradual progression throughout. As you move to the higher levels, less and less English is used. The inclusion of grammar and cultural notes is really useful. While the design of PortuguesePod101 could be improved, the quality of the content makes up for it. Read our full review of PortuguesePod101. Audible is Amazon’s audiobook service. You can find audiobooks narrated in Portuguese from authors like Paulo Coelho, as well as audiobooks specifically made for learning Portuguese. You’ll find lessons from Michel Thomas, Pimsleur, PortuguesePod101, and a bunch more. You can also get two free ebooks if you sign up for a 30-day trial. While I’m more inclined to recommend Spotify as a way to help discover Portuguese music that you enjoy listening to, you can also find courses for learning the language. Although I haven’t tried these lessons out, I wouldn’t expect them to be the best lessons around. That said, they’re free, and if you’re already using Spotify, they may be worth checking out. Glossika is a resource that I think is useful but terribly overpriced. It’s a fairly simple app that will help you drill tons of sentences. The biggest benefit to it in my mind is that it gets you speaking, a lot. There are other components as well, such as quizzing, but the majority of the platform is repeating sentences. At $30/month, I could only really recommend it if you plan on using it extremely extensively for a month or two and then cancelling your subscription. Luckily, you’ll gain access to all of the courses for that price which includes both European and Brazilian Portuguese, among many other languages. Read our full review of Glossika. Forvo is a pronunciation dictionary. Anyone can submit a recording of themselves saying any word, so you get authentic pronunciation from people all over the world. For each word, you can also see where the person is from on a map, making it possible to hear some regional differences in pronunciation. The first two apps I’ll post in this section could easily have landed in the listening section. That’s because you can read and also have the audio played. Let’s take a look at those first and then the other apps that fall into this category. LingQ is a popular app for reading and listening to content in many languages, including Portuguese. You’ll find various lessons, podcasts (with transcripts), articles, and more on LingQ. It’s a bit more than just an app with reading and audio though. When you start, all the words are highlighted in blue. As you read, the highlight gets removed if you mark it as known, or you can look them up and see definitions, which turns the highlight to yellow, meaning you’re learning it now. It tracks how many words you know and it can be fun seeing that number increase. A lot of the content is added by users, coming from all sorts of different places. It’s also arranged by difficulty level, making it easier to find something suitable for you. Another feature that I like is the option to import your own text. I’ve used LingQ to add full books that I’ve found online and found it to be a very convenient way to practice reading. Read our full review of LingQ. along with a story and check back to the native text, being able to listen to the audio in either language. One limitation is that you can only look up the meanings of entire sentences and not individual words. Usually though, the meaning can be deduced. Lots of the content is children’s stories, but more articles involving science & technology or culture have been added lately. While some of the content is free, to get full use you’ll have to pay a little bit (but it’s not too expensive). Langliter is a newer reading app made for people who are already around the intermediate level and want more reading practice. With Langliter, you can read news stories or ebooks. When you come across a word that you don’t know, you can click on it to see a definition in the same language, as well as a translation. Additionally, you can read offline, upload your own ebooks, and review using flashcards. Flowlingo is quite similar to Langliter in that both are newer apps that make it easier to read native content. WIth Flowlingo though, there are a lot more options of the type of content you read. For example, Reddit Brasil, O Globo, Wikipedia, or you can add the url yourself to read content from your favorite places. When you click on a word, you’ll see the translation and also hear it pronounced. As you click words, they’ll be saved for you to go back and study later using their flashcards. Readlang is a web app that also makes it easier to look up words as you read content online. Just click on a word while reading and it’ll be translated for you. Additionally, you can have full phrases translated, but that’s limited to 10 per day before you’d need to upgrade to their paid plan at $5/month. However, there’s no limit on individual words. All the words that you click on to translate will be saved automatically and added to the flashcards section. I’ll talk more about italki in the next section as that’s where it fits better. But, there’s one feature of italki that is often overlooked and available for free – the Notebooks section. This is the best place to get feedback on your writing by a native Portuguese speaker. It’s really easy to use. Basically, you just write a journal entry about anything you’d like and people will come in and give you corrections. It only works because people are also willing to help others out, so be sure to do the same and give feedback to other language learners. Read the full review of italki. Obviously, if you’re serious about learning Portuguese, you’ll need to actually talk to some Portuguese speakers at some point. While it’d be great to take an extended trip to Brazil or Portugal, this isn’t an option for most people. Even if it is an option for you, you’d still benefit from some practice before you arrive. italki is, in my opinion, pretty easily the best place to find a tutor or language exchange partner. You can book classes directly from a teacher, making it far cheaper and much more flexible than other places. Currently, there are 168 Portuguese teachers available with many of them offering classes for under $10 per hour. There are two types of teachers; community tutors and professional teachers. The professional teachers have a professional qualification that they were required to upload, whereas anybody can be a community tutor. Community tutors tend to charge a bit less and classes are typically less formal, usually conversation based. Italki is also an excellent place to find a language exchange partner. To do this, you would just go to their community section, select the language you’re learning and one that they speak. You can even narrow search results based on where they’re from. Then, you can read their profile to see if you think you’d get along well and send a message or add as a friend. Verbling is a pretty good option for taking online classes from a teacher. In most ways it’s very similar to italki. You’ll book lessons directly from a teacher and it’s very flexible. Lessons on Verbling are a bit more expensive than italki for whatever reason, and there are fewer teachers to choose from. That said, I do prefer the design and platform of Verbling to that of italki. Read the full review of Verbling. HelloTalk is perhaps the best and most popular language exchange app around. It’s really easy to use and begin chatting with people all over the world. They have an absurdly large amount of users interested in practicing their language skills. You can make voice or video calls. Additionally, there are lots of extra and useful features like translations, a way to make writing corrections, groups, and more. If you’re an English speaker, you’ll find tons of people are interested in chatting with you. From what I can tell, these two apps are very similar to each other, as well as to HelloTalk. You can browse profiles, find someone you’d be interested in talking with, and add them as a friend. I’ve never used either of them so I can’t comment too much but both seem to be quite popular. Lingbe is newer and not as well-known as the other language exchange apps, and they do things a bit differently. With some (or all?) of the other language exchange apps, there can be a pretty long lead up time before you actually start speaking Portuguese. You have to spend time browsing profiles, sending messages, arranging a time where both parties are available. With Lingbe, all you have to do is click the call button and you’ll quickly be connected with someone to practice with. When you do find someone you enjoy talking with, you can add them and stay in touch. 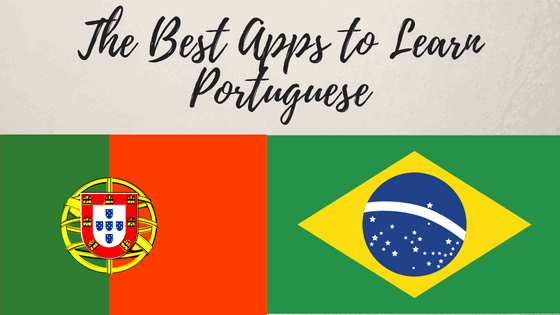 While there may not be as many apps made specifically for learning Portuguese as there are with other languages, there are still plenty worth using. I’m sure I must have missed something useful. There are a few popular resources that I didn’t include, just because I don’t think they’re very good – Rocket Portuguese, Earworms, and Rosetta Stone. Similarly, one of my favorite resources, Semantica (review), doesn’t have an app so I didn’t include it here. Let me know if there are any other useful apps for learning Portuguese that I didn’t include in this post.